I’ve reviewed the CD of this in the current issue of Music Street Journal – so for detailed information about the main performance, please see that review as the music is the same. 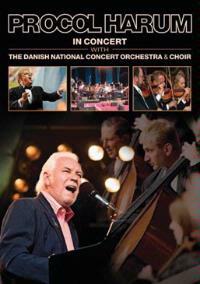 This DVD showcases Procol Harum in live performance with orchestra and choir – as the title tells us. The concert is from 2006, so that means the recording technology is good. The video and sound both show that. This is a killer concert, despite the sometimes heavy handed nature of the arrangements – see the CD review for more on that. This concert by itself would be worth the price of admission, but there’s a bonus show – a TV concert from 1974. The video on this one is surprisingly good, but the sound is a little low. It’s also a weird vibe, the band playing amongst a night club with people just mingling around. It’s a major contrast to the killer festival crowd in the main show. Still, all in all this is a great DVD and should please all fans of the band.